Animals can communicate with humans and here you will learn how and why it is important we try to see their point of view. Why did my cat stop using the litter box? Why does my dog chew up the rugs when I leave the house? Will my current pet accept a new addition to the family? How will I know when it's time to put my sick pet to sleep? 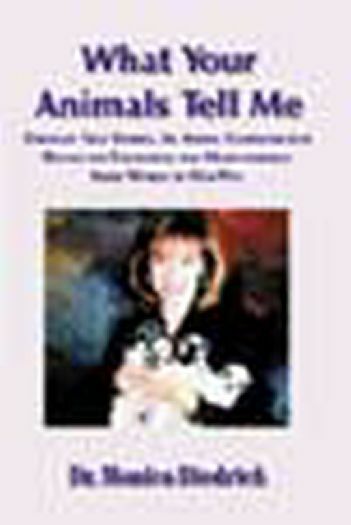 Do animals have soul? Join author and pet communicator Monica Diedrich on a fascinating journey into the hearts of clients understand their pet's needs,solve problem behaviors, and forge stronger bonds with animals based on love, compassion and respect. These heartwarming stories will entertain, encourage, and even surprise you. Meet Ebony, the poodle who receives regular visits from the spirit world; Butch, the proud rottweiler who refuses to be called Joey; Tasha, the regal wolf-dog who explains her wild side and the limits of domestication; and Piñon Tosca, the injured horse who longs to jump again.